Having problems with Wifi coverage in your home? Looking for a little internet speed boost? 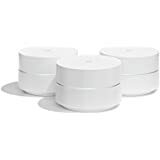 I recently purchase the new Google Wifi – Mesh Network Internet Router, and I must say, I am very happy with my purchase! My network speed increased by 3 times over my old router. Coverage is awesome. I get wifi all over the house (inside and out)! Being in IT, setup for me is usually relatively easy for stuff like this, but I can honestly say that setup would be a snap for anyone that can work a smart phone. I have Xfinity for my internet provider, but the following principal probably applies to most. When you open the box and begin setup, you’re instructed to plug the provided ethernet cable into your Google wifi module in the appropriate place. Then plug the other end of that same cable into your modem LAN port. Start the smart phone app and begin setup. However, setup immediately attempts to connect to the internet, and almost invariably, it won’t be able to. That’s because you need to restart your internet modem first. That way, your internet modem can acknowledge you have a new router attached and allow it access to the internet. Do this, and the rest of the setup should be a snap! If your house is larger than 2000 sq. ft., then I highly recommend the 3 pack (link below). It’s three modules that talk to each other and act as 1 wifi network, and it’s all seamless to you. The smart phone app is one of the best parts of this product. You can control your wifi settings from anywhere in the world with cool configs like Prioritize devices for best internet performance while having a huge family party. Yes, I’ve prioritized my phone during a family party. I have the power! You can also setup a guest network that allows visitors to use your network, but only have access to the devices you allow such as a printer. You can also set a separate password for the guest network so you don’t have to give your main network password out to just anybody. Seriously, I have never had a wifi router that gets the speeds I’m seeing over wifi. Ever. It’s impressive. Another cool thing is that Google is constantly updating your router with security updates, so you never have to worry if your wifi router is old tech. If you’re a prime member, there’s still time to get it before Christmas. So, click here to go to Amazon and reward yourself with the best wifi router ever!